Billing themselves as a brewery that pushes past the traditional and embraces creativity, Modist Brewing set out to distinguish itself in the fast growing craft brewing community of Minneapolis and St Paul. 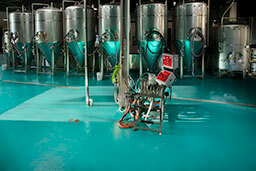 In the build-out, two flooring systems were required: one in the brewery and another in the communal taproom. 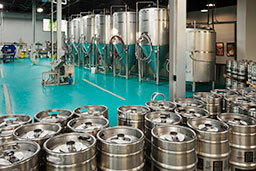 Each system needed to provide a safe environment which cleans easily while promoting Modist Brewing’s creative identity. 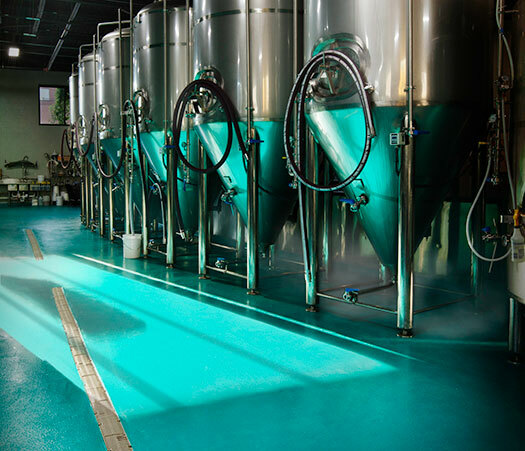 In keeping with the industrial look of the brewery, the customer facing area was the perfect location for Tennant’s satin high protection system with a grout coat of Eco-PT™ Topcoat. Clear in color, this system helps preserve the bare concrete look, while adding slight texture for added slip resistance and high traffic wear. 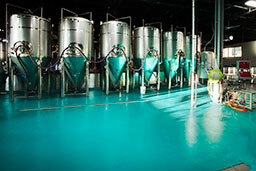 By recommendation from their peers in the brewing community for its great performance, Tennant’s Eco-Crete™ cementitious urethane coating system was chosen as an essential part of the brewing operation. 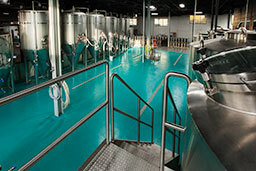 While standing up to considerable foot traffic and heavy duty cleaning, its bright custom teal color reflecting on the stainless steel tanks became an essential ingredient to the Modist brand, and casts a creative and unique atmosphere. This system uses Eco-MPE™ as the epoxy primer, followed by a grout coat of Eco-PT™ Topcoat to help eliminate out-gassing and fill in any rough areas. A build coat of Eco-MPE™ is applied to create a smooth surface and finally a topcoat of Eco-HTS™ 100 is applied to create a durable, light-stable, chemical resistant satin finish.